← Peeples: Why is Evidence Ignored in Storage and Thrown Away? 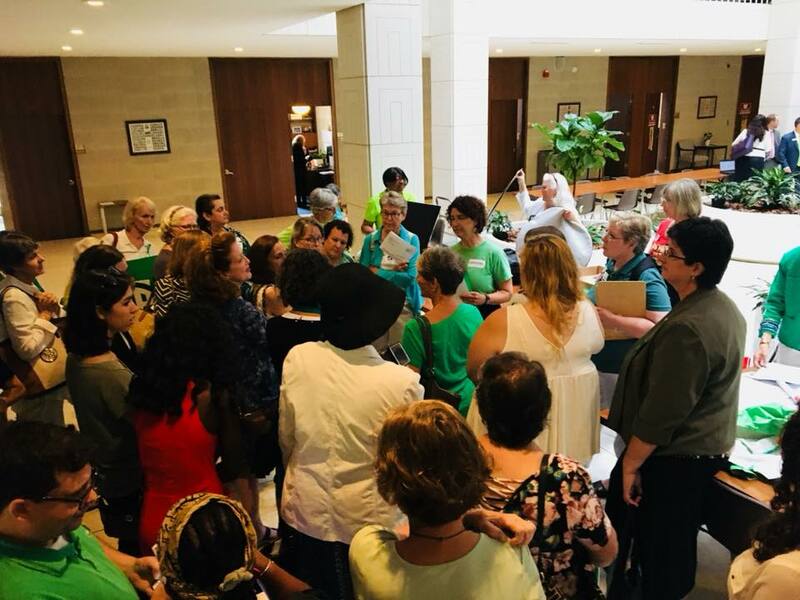 The ERA NC Advocacy Day on Wednesday, 6/27/18, included at least 100 women and a few good men from across North Carolina, many dressed in green and white. 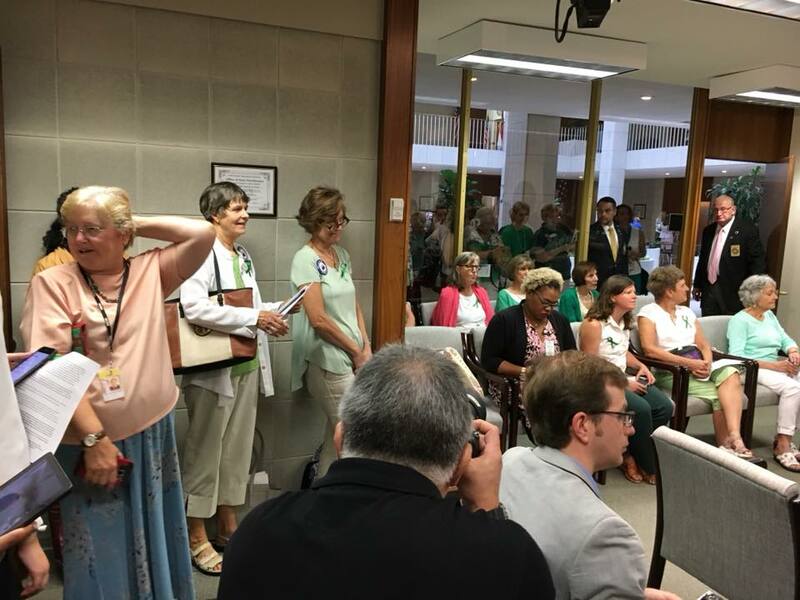 The event was organized by the ERA-NC Alliance and associated groups (including NC NOW, NC4ERA, RatifyERANC, AAUW-NC, LWV-NC, BPW-NC) as follows at the Legislative Building, 16 W. Jones St.
By 10am, we had about 35 people in the press room and another 65 or more outside the window, looking in. We’re going to step in the pool. Senator Floyd McKissick spoke after the poem. McKissick has been a constant and consistent champion for women. He was our first sponsor of the ERA bills, agreeing readily to start work on wording in 2014. Joyce Waddel spoke. Sen. Mike Woodard spoke. When it went back to Sen. Erica Smith to close, she had women call out where in NC they came from (since the few out of staters had been mentioned). She also did a shout out to the 40-50 women outside the window (we later found out the count was at least 65 outside the window, looking in). At 10:30am, we got our delivery and discussion tips, and groups of women and a few men went out to deliver packets to legislators in the two buildings. The packets included a FAQ from a law firm that is working with ERA-NC Alliance! After the press conference, Audrey Muck gave instructions and Lori Bunton and others gave out the packets to groups of people to deliver. Most groups were done delivering by 11:30am. This entry was posted in Equal Rights Amendment, ERA and tagged equal pay, Equal Rights Amendment, ERA, reproductive rights. Bookmark the permalink.